A seventh chord is a triad which has been extended to include the 7th. Seventh chords create a much fuller sound than triads and are used in jazz music to create richer harmonic progressions. There are 5 main types of seventh chord that you need to learn – major, minor, dominant, half diminished and diminished. 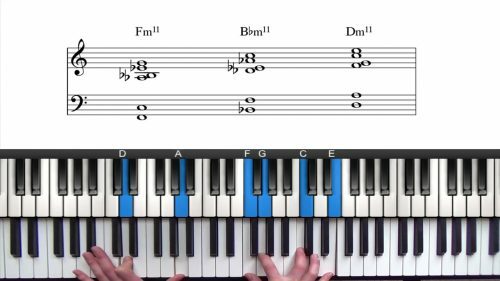 Learning these chords and understanding their function in harmony is essential for learning jazz piano. 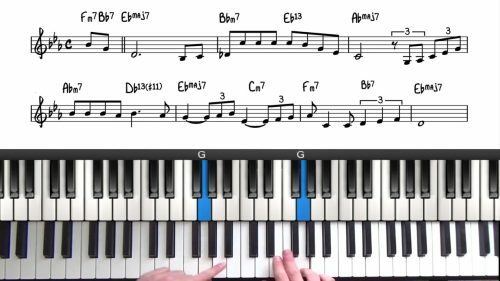 The vast majority of chords you will come across in jazz will be one of these 5 chord types. First of all we have the major 7th chord. The major seventh chord is built by playing the 1st, 3rd, 5th, and 7th notes of the major scale. The interval relationship is root, major 3rd, perfect fifth, major 7rd. In the key of C, the root of the chord is C, the major 3rd is E, the 5th is G and the major 7th is B. We can also build a major 7th chord from a major triad with a major third stacked on top. The dominant 7 is a very important chord. It has an unstable sound and wants to resolve to a major chord a fifth away. Dominant chords give movement & tension to a piece of music. Dominant chords are built by playing the 1st , 3rd , 5th and flat 7th of the major scale. A quick way to build a dominant chord is to play the major chord and then lower the 7th note by half a step. We can also build a dominant 7th chord from a major triad and a minor third stacked on top. The interval relationship of dominant chords is root, major 3rd, perfect 5th, minor 7th. It’s important to note the presence of the tritone interval in the chord. This is what gives the chord it’s unstable and tense harmonic quality. If you are unsure on what a tritone is, watch the lesson on intervals. The minor 7th chord is built in the same way as the major 7th chord except we use the 1,3,5 & 7 from the natural minor scale. The interval relationship is root, minor 3rd, perfect fifth, minor 7th. To find out the natural minor scale you simply take the major scale and lower the 3rd, 6th & 7th notes. You can also build a minor 7th chord by playing the major 7th chord and then lowering the 3rd and 7th note by a half step. Alternatively, play the dominant chord and lower the third by half a step. We can also build a minor 7th chord from a minor triad with a minor triad stacked on top. The minor 7 flat 5 chord, also known as the half diminished chord is most commonly used as the 2 chord in a minor 251 progression. Minor 7 flat 5 chords are built using the 1, b3, b5 and b7 of the major scale. A simpler way to build a half diminished chord is to play the minor chord of the key and flatten the 5. We can also build a minor 7th chord from a diminished triad with a major third stacked on top. The interval relationship of a half diminished chord is root, minor 3rd, diminished 5th & minor 7th. Finally we have the diminished 7th chord. Diminished 7th chords are the strangest sounding chords of those we have covered so far. You could also look at diminished chords as a minor 7 flat 5 with a double flatted 7. We can also build a diminished 7th chord with a diminished triad and a minor third stacked on top. The diminished chord does not have a definite tonal center which makes them sound ambiguous. You can use this as a device to add tension to a piece and the resolve the chord. 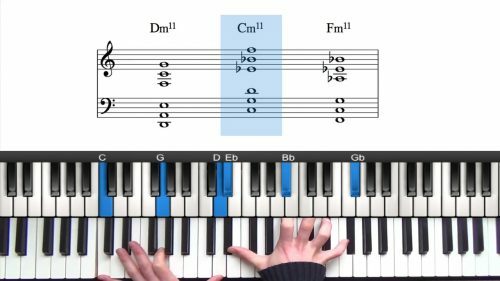 The best thing about diminished chords is that you only have to learn 3 of them for all 12 keys as when you invert the chord it creates a diminished chord a minor third above. The Herbie Hancock voicing is a rich-sounding, two-handed minor 11th chord. This voicing definitely has a funky vibe to it but you be the judge! After you can build these chords in root position, you'll need to run through the different inversions. To invert a chord simply take the bottom note and put it on top. The bass note is now the third of the chord - this is what we call the first inversion. Now invert the chord again by putting the lowest note on the top. The bass note is now the fifth of the chord - this what we call the second inversion. Finally, you can invert the chord one more time (all four note chords can be inverted 3 times) The bass the note is now the 7th of the chord. This is what we call the third inversion. Note: if you invert the chord again you will be back at root position. Don't worry about mastering all of the inversions in the short term... this is a gradual process, but at least try it with a few keys so you are able to visualise inverted 7th chords.